Winter is not fun. Sure, it has its moments: I like skiing, both downhill and cross country, but the Nordic winters are so long it´s ridiculous. Some people have more sense than others, and head for the southern hemisphere. Spending February in New Zealand doesn´t sound too shabby, but alas, that´s not gonna happen this winter. Well, at least the days are getting longer, and in a few months´ time, the fish will be rising again (however unlikeliy that might seem right now). Till then, we´ll just have to cope somehow. These pictures are from one of last summer´s better days. One early Narvik morning in late June, I packed all my gear into my mother´s -98 VW Polo and drove flat out towards one of the better road-near rivers on Nordkalotten. On the way, I hooked up with Harstad homeboy Erlend Welde, co-founding father of Utras.net, easily one of the better Scandinavian fly fishing blogs at the moment. It turned out to be a really tricky day on the river. Late June is still early in the season on this particular water, and the river ran very high and very cold. Sparse hatches of small BWO mayflies and the occasional feathermidge didn´t seem to impress the river´s spoiled brown trout and arctic char, so when local fly fishing legend Alf M. Sollund (check out his Flickr here, lots of great shots) called Erlend and suggested a coffee break, it seemed like a really good idea. The coffee was perfect, but one hour later, the river was still completely non-happening. Alf decided to have a go from his kayak. Fortunately, Erlend knows this river a lot better than me, and had an ace up his sleeve: A slow flowing, shallow and wide part of the river which can sometimes be good when the water is high and cold. And it was. Good, I mean. Not really good, but at least OK – a quite decent BWO hatch made some quite decent fish rise quite frequently. Erlend won the lottery, and made the first cast on the best looking fish. A couple of minutes later, a decent arctic char was brought to the net. The fishing that followed was not that bad. A few small-to-medium-sized fish were kind of interested in feeding from the surface, and took our flies with moderate enthusiasm. And then the wind and rain came. The End. Just as we left the spot, Erlend got another call from an Alf, who spoke with speaker-cracking intensity. Paddling around in his kayak, he had spotted a serious brown trout, estimated around 4-5 kgs. It almost took his fly. However, he had somehow managed to convince a 2,2 kg trout to take his nymph. An incredible catch on such a slow day. Erlend and I went to the local burger joint. After dinner, we searched all over the place for active fish. One top secret spot after another, all stone dead. Around half past nine in the evening, we met Alf again as he was getting ready to leave. After those two big trout, he hadn´t seen anything at all, despite covering miles and miles of river in his kayak. Erlend mumbled something about a pregnant wife waiting at home. We decided to have one more look at a certain stretch of the river and then call it a day. The first thing we saw as we peeked through the dense vegetation was a big, juicy mayfly sailing like a schooner down the river. And then we saw another one. And another one. Pretty soon it was a proper armada. 2011´s first Ephemerella Aurivillii hatch was on – and it started after ten o´clock in the evening! Nature is gloriously uncivilized and unpredictable up there (and so are the people, by the way). It just doesn´t behave like it´s supposed to – maybe because of the perpetual daylight – who knows. And who cares? The trout certainly didn´t care, and wasted no time. A long row of feasting trout lined up in the seam of the current, close to the steep bank. 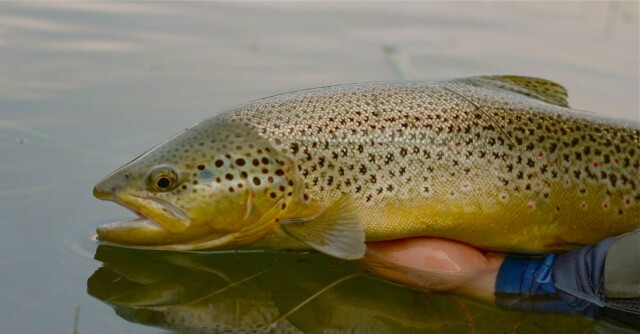 The trout, many of them big, rose steadily, gulping down most of the mayflies that floated helplessly over their heads. And we were the only fishermen there. One and a half hour later, we were back in the car. Although it was still as light as the day, it was midnight, and the hatch was over. At least that´s what we told ourselves – we had to leave anyway. Ninenty minutes of pure, exhilarating magic, filled with the very essence of the sport: magnificent, wild fish rising steadily to large mayflies. Nirvana for a flyfisherman. It’s a Hog! It’s a barn door! Maybe some warmsaltwater fishing needed ?